The application for the T2023-S$ Temasek Bond has closed on 23 Oct. With aggressive marketing for the past two weeks, information on the 5-year bond can be easily accessible on the Temasek website. The public offer has seen a subscription rate of over 8 times whereas the tranche for institutional investors was 7.19 times subscribed. Despite the euphoria around the Temasek's first retail bond, it has received lukewarm reception from The Boy who Procrastinates. Aside from the fixed interest rate of 2.7% per year and its Aaa/AAA credit rating by Moody's and S&P, I will assume the role of a devil's advocate and elucidate my reasons for not applying for the Temasek bond in this article. Many have advocated using CPF to invest in Temasek Bond given that its interest rate is 0.2% higher than that of CPF OA at 2.5%. On the surface, this appears to be a sound advice for savvy investment. However, it's not all rosy if we were to dig deeper into the numbers. Unlike CDP, to invest using CPF OA, it is required to set up a CPF Investment Account with DBS, OCBC or UOB. Apart from the one-time application fee, an investor would be subjected to a recurring cost of $2 per counter per quarter. This sums up to a fee of $8 per year. Before computing the effective interest rate of the Temasek Bond, let's assume that a successful applicant was allotted $6,000 of bond, which is the allocated amount for approximately 82.5% of the issued bonds. Each year, the investor will receive $162 of interest. Net of the quarterly fee, the effective interest rate is 2.57% per year, a paltry gain of 0.07% instead of the expected 0.2%. With the inclusion of the quarterly charges, the cut-off amount in which the effective interest rate of the bond is equivalent to that of CPF OA is $4,000. Any amount below $4,000 would incur a loss as compared to leaving the money in CPF OA untouched. If one has to invest, it probably makes sense to invest using cash instead of CPF OA due to the quarterly fee that erodes returns. In general, the interest rate and bond prices have an inverse relationship. Running the risk of oversimplification, when interest rate rises, investors demand for higher yield, leading to the fall of the market value of the bond. But of course, if one intends to hold the bond till maturity, the price fluctuation in the market is just noise that one should be impervious to, especially with the low default risk associated. Aside from the price fluctuation of bond, it is equally essential to assess the attractiveness of other instruments in a rising interest rate environment, which brings me to the following area of concern. Even though an investor can sell the Temasek bond on the secondary market, he is likely to run into large bid-ask spread for the trading of bonds. The investor would be caught in a quandary on whether to price the bond lower and realize losses on the sale. Given the barrier to exit the position, shifting the investment funds from Temasek Bond to other high yielding instrument would prove to be an arduous task. Removing high-yields savings accounts and GREAT 270 Endowment Plan from the equation, I would consider Singapore Savings Bond ("SSB") to be the natural substitute to Temasek bond in the local market in terms of the level of default risk, as well as the nature of the investment products. 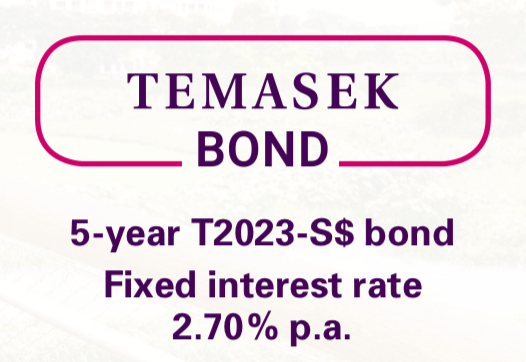 According to the SSB website, the average 5-year interest rate for the Nov issue is 2.22%, 48 basis points less than that of the Temasek Bond. The coupon rates for each issuance of SSB are determined with the Singapore Government Securities ("SGS") benchmark yields as reference. These reference yields are based on the simple average of the respective daily SGS benchmark yields of the previous month. To extrapolate the coupon rate for the following issue, we can take the simple average of the daily 5-year SGS yields. From this, we can deduce that the average 5-year interest rate for Dec issue will be 2.33% based on 19 out of 23 business days. If we were to assume that this would be the final 5-year interest rate for Dec issue, the interest rate gap between SSB and Temasek Bond will narrow by 11 basis points. Historically, this would be the highest 5-year interest rate for SSB. On the topic of liquidity, an investor has the option to redeem SSB in any given month before it matures. A transaction fee of $2 will be incurred and the redemption amount, together with pro-rated interest will be paid out to the investor within a month. If we were to compare the SIBOR and the 5-year SSB interest rate, we would see that the rates generally appears to be moving in tandem to a certain degree. 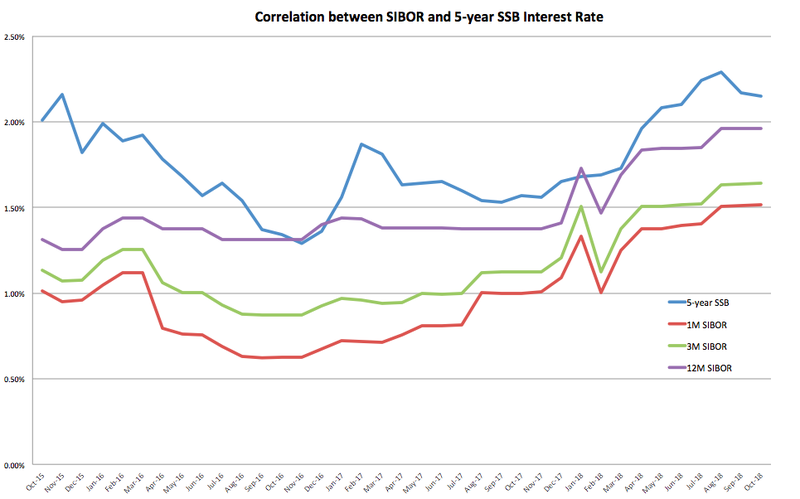 In my previous article, I have also discussed about the correlation between SIBOR and US Fed Fund Rate. Since then, the US Federal Reserve has recently raised the interest rate to 2.25% in September and have targeted one more rate hike in 2018 and likely three more in 2019. Would the 5-year interest rate of SSB eventually surpass that of Temasek Bond? At this junction, it may be difficult to tell but it is not beyond the realms of possibility. Of course, everyone might have their own rationale to invest in Temasek Bond such as achieving a balanced portfolio allocation. Different strokes for different folks. However, there are certain aspects that one should be mindful of especially when investing with CPF. Clearly, I might have been biased towards SSB but with justifiable basis. I am willing to trade 0.48% interest rate in exchange for the liquidity to exit the investment with ease. This factor is particularly crucial to me in a rising interest rate environment. Disclaimer: Kindly note that this is not a sponsored post. The author is in no way affiliated with the stated financial institution and does not receive any form of remuneration for this post. All information in this post is published in good faith and for general information purpose only. The ideas and opinions expressed in this post are purely that of the author's and should not be used or construed as an offer to sell, a solicitation of an offer to buy, a recommendation for any security or as professional financial investment advice. The Boy who Procrastinates has compiled the information for his own reference, with the hope that it will benefit others as well. With the enhanced version first launched in April 2014, OCBC will be revising the interest rates on OCBC 360 Account for the third time with effect from 1 November 2018. This article aims to provide an overview of the upcoming changes and whether the existing account holders stand to benefit from the revision. You may also wish to refer to the OCBC website for more information. Many would probably have remembered the initial version of OCBC 360 Account that allows one to earn the classic 3.05% interest rate back in 2014. This was also during the period when a series of high yield savings accounts was subsequently launched by various financial institutions. Naturally, I am no exception as I recalled dropping by one of the OCBC branches to set up the acclaimed savings account right after signing my employment contract. 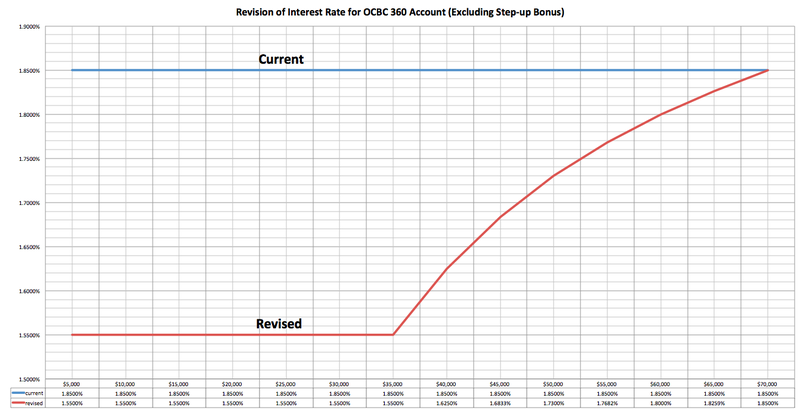 However, all good things usually come to an end eventually when OCBC has revised the bonus interest rate earned on the 360 Account on 2 separate occasions over the last 4 years. Even though the maximum account balance (for which bonus interest is accorded) has expanded by 40%, the effective interest rate (taking into account the fulfillment of 3 conditions only as listed below) has gone down 39.3% correspondingly. Overall, the maximum bonus interest earned in a given year has declined by 15.1%. 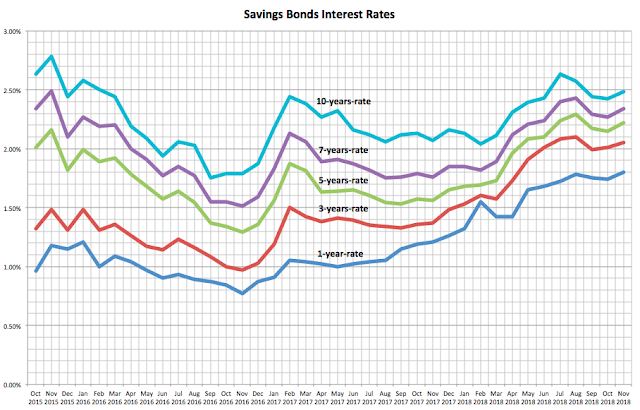 Let's examine the alterations that have impacted the interest rate earned on the savings account. ✒ The maximum account balance that can earn bonus interest rate has remained at $70,000. ✒ The amount of account balance that is eligible for bonus interest has been split into two tiers divided by the $35,000 mark, instead of the current one tier. It is probably difficult to tell if this is a positive or negative revision on the face of it. Further investigation with numerical figures related to the interest is warranted. ✒ Boost Bonus: Account holders can now earn 1% interest on the incremental amount based on the previous month's and current month's average daily balance ("ADB"), up to a cap of $1,000,000. Since the interest rate of 1% is offered on the incremental balance only, the interest earned is usually a negligible amount, making this a hardly fascinating component to me. There is chatter among forums with regard to the method of transferring in and out a sum of idle fund on alternate months to maximize the boost bonus. However, this practice delivers interest derived from boost bonus in only 6 out of 12 months, effectively halving the 1% interest rate over a year's duration. Not an efficient use of idle funds, if you ask me. ✒ Grow Bonus: This category has remained untouched with the earning of an extra 1% interest rate on the first $70,000 if the account's average daily balance is at least $200,000. Personally, this is another segment that I will not be excited over. If I have an additional $130,000 idling around, I will definitely not put it in the 360 Account just to earn that paltry $765 bonus and base interest in a given year. Breaking down the marginal interest on the extra sum reveals that a meagre interest rate of 0.588% is earned. Incremental amount beyond $200,000 diminishes the marginal interest. ✒ Wealth Bonus: As this segment requires the purchase of eligible OCBC financial products such as insurance and unit trusts, it might constitute an onerous hurdle for the average account holder. Hence, I will omit this from further discussion. ✅ Salary Bonus: Account holders can now earn 1.2% interest on the first $35,000 and 1.5% on the next $35,000. The effective interest rate on $70,000 balance contributed by this category is 1.35%. The minimum salary crediting amount has remained unaltered at $2,000. ✅ Spend Bonus: Account holders can now earn 0.3% interest on the first $35,000 and 0.6% on the next $35,000. The effective interest rate on $70,000 balance contributed by this category is 0.45%. The minimum credit card spending amount on OCBC credit cards has remained unchanged at $500. ✅ Step-up Bonus: Account holders can now earn 0.3% interest on the first $35,000 and 0.6% on the next $35,000 if there is an increment of at least $500 in the current month's ADB as compared to that of the previous month. An intriguing category which OCBC has added, though I must say that I am not a big fan of criterion that limits the flexibility around the flow of funds. Undoubtedly, this has imposed certain restriction in the withdrawal of balance from the savings account, much like Citi MaxiGain Account (as discussed in the Passive Savings Accounts), albeit less stringent. On the face of it, this step-up condition can easily be fulfilled with the crediting of salary. However, one should be aware that it is the month's ADB that is being benchmarked against, and not the balance at the end of a month. For example, if the crediting of salary is towards the end of a calendar month, it might reduce that particular month's ADB. This is likely to affect the step-up bonus for the first month only, ceteris paribus. Another common impression that one might hold, is that by transferring/spending $1,500 out of $2,000 salary that has been credited, one might still be able to meet the requirement of the step-up bonus. As the step-up of $500 is determined by the months' ADB, it would largely depend on period when the salary is being credited. One of the more reliable methods that one can employ is to transfer in $500 at the start of the month, probably via standing instruction. This way, the account holder will have no withdrawal restriction on the salary that is being credited subsequently. ❌ Payment Bonus: OCBC will no longer offer bonus interest earned from the payment of 3 bills on the 360 Account. Even though this segment currently provides an interest rate of 0.3% only, it is still a shame that they intend to discontinue this category. Personally, this is one of the effortless criteria one can complete. Coupled with credit card spending, I would usually prepay $1 to 2 other credit cards to fulfill the payment of 3 bills. For ease of comparison, consider the scenario in which the salary, spend and step-up bonus of the revised account are fulfilled. By plotting the trend lines of the current and revised effective interest rates, we can observe that they coincide at $35,000 balance and subsequently diverge from there. At the maximum account balance of $70,000, one can earn an effective interest rate of 2.3%, which translates to a gain of 0.45% or $315 extra interest per year over that of the current effective interest rate. Therefore, the revision generally benefits account holders who have parked more than $35,000 in their accounts. For those who prefer a hassle-free approach that allows the flexibility of channelling the funds to better use, Nov 1 probably marks an unwelcome update to the 360 Account. If the salary credited was immediately transferred out of the savings account, the step-up bonus would be unaccomplished. In such scenario, the revised effective interest rate consistently stays at 1.55% for the first $35,000, and eventually climbs to 1.85% at $70,000 balance. Interestingly, there is no change to the interest from what you have already been collecting in the current version of 360 Account at $70,000 balance. However, the interest rate will be significantly reduced at any other lower amount. Nevertheless, I would still regard this as a positive change due to the higher bonus interest for the second balance tier, as well as the choice to earn interest from the new category of step-up bonus. For those who have reached the maximum balance of $70,000 that earns the bonus interest, one common query that you might have is whether it is worthwhile to continue stepping up $500 a month. To answer this, let's assume that an account holder has set up standing instruction to transfer $500 into the account at the start of the month and the salary that was credited thereafter, was withdrawn within the same day so as to maximize the use of fund. The $500 increment, on top of $70,000 balance, will earn the interest of $26.75 from Step-up Bonus, $0.42 from Boost Bonus and approximately $0.02 from Base Interest each month. However, after the account holder steps up $500 in the second month, the extra $500 which was transferred in the first month will be earning interest from neither Step-up Bonus nor Boost Bonus. For sake of simplicity, I will regard this as idle fund - money that are earning only the base interest of 0.05%. In the above table, the amount of idle fund gets larger with each $500 contribution and correspondingly, the marginal interest declined noticeably. This cycle can always be reset at any time once the marginal interest reaches an insignificant point. Even though it is accurate that the account holder earns 2.3% on the first $70,000 balance for every monthly step-up of $500, one should not discount the opportunity cost incurred by the idle fund accumulated. With the inclusion of the idle fund, the total effective interest rate dwindled gradually over time. In the illustrated scenario above, the average effective interest rate over a period of 12 months is approximately 2.21%. One way to maintain the total effective interest rate of 2.3% is to carry out a backward calculation on the estimated ADB. To illustrate this, assume that there are 30 days in a given calendar month. An unknown sum should be deposited on Day 1 and be maintained till Day 29. Afterward, the unknown sum is withdrawn on Day 30 with the criterion for Step-up Bonus met. To solve this, let x be the amount that should be transferred into the savings account at the start of the month. In this scenario, transferring $536 on Day 1 and withdrawing the same amount on Day 30 will still achieve the ADB incremental of $500. As a rule of thumb, we can coupled this with the longest month of 31 days and take into account the shortest month of 28 days. 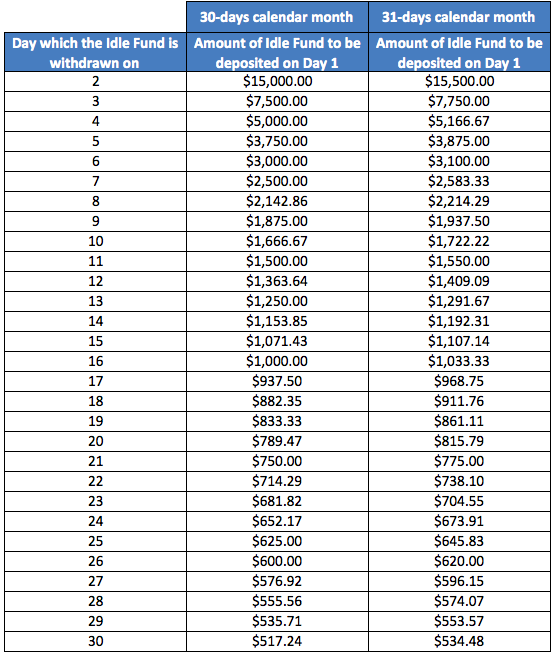 It will be a deposit of approximately $600 on Day 1 and withdrawal of the same sum on Day 27. To maintain the effective interest rate of 2.3%, the x amount will have to increase by approximately $600 each month. Using this method will still incur opportunity cost for the fund that is in the account for 26 days. But of course the concept is similar. The larger the quantum of x, the shorter the duration that you have to maintain the sum in the account. But when the amount of step-up fund gets too significant, it is probably better to reset the ADB at some point. Following from the previous post on the comparison on active savings accounts, let's see where does OCBC 360 Account stand with the upcoming revision. 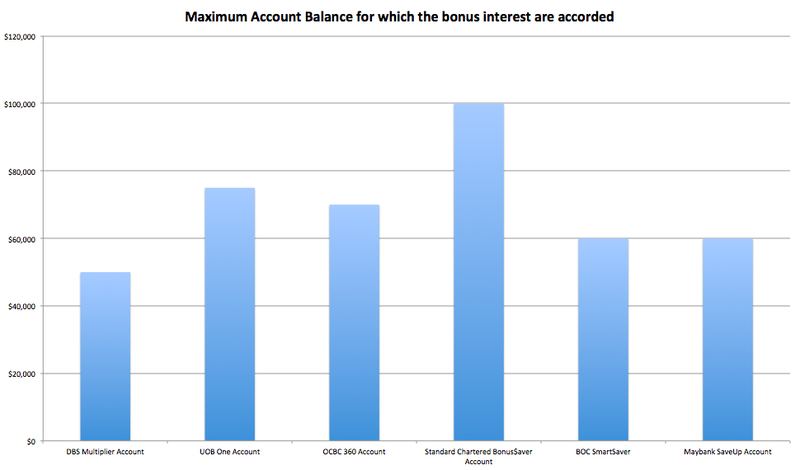 With no alteration to the maximum account balance that earns the bonus interest, the OCBC 360 Account has remained at third place, behind the Standard Chartered Bonus$aver Account ($100,000) and UOB One Account ($75,000). 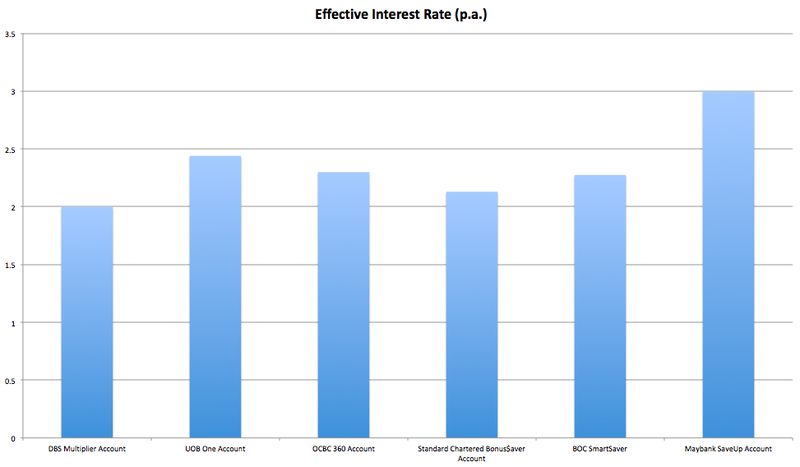 At 2.3% effective interest rate, OCBC 360 Account has soared to the third from the bottommost, almost a tie with BOC SmartSaver (2.275%). However, one should be aware of the diminishing interest rate that comes with the accumulation of idle fund. If we were to judge solely by the prerequisite of crediting salary, OCBC 360 Account still offers the highest effective interest rate at 1.2% on the first $35,000 and subsequently climbs to 1.35% at $70,000 balance. Maybank SaveUp Account offers the best bang for the buck at 3% effective interest rate, albeit with a taxing requirement of at least $300 GIRO payment or the qualification of any of the other 6 products/serivces. UOB One Account is the runner-up at 2.44% with comparatively relaxed criteria.